I am excited to again be playing at the Muse Card Club for their Challenge #3 using this beautiful card by Laurie Willison as our inspiration point! If you haven't seen this new take on challenges, please stop by and take a look! I was inspired by the beautiful vines and flowers and the two background panels as well as the large flower and gorgeous orange color. Hope you take time to check this out, I know you will love it! Oh wow, do I ever love your flower and vine! Wonderful card Patti with the shadow effect of the vines in the background. wow! Wow Patti, this is truly inspired! I just love the leave design and the idea of using the dictionary for the flower-so cool. Great take on the muse card! Love the vines, so inspiring! This is fantastic, Patti! I absolutely love how you used both the positive and negative leaves around your rocking text flower!! Really pretty Patti! I love your flower and the vines! Your Silhouette Cameo vines are beautiful and the dictionary page flower is sooo pretty! So glad you played along with us at Muse!!! Very pretty card. I love the positive and negative cuts mimicking the two tones of Laurie's card. The news print flower finishes it perfectly. 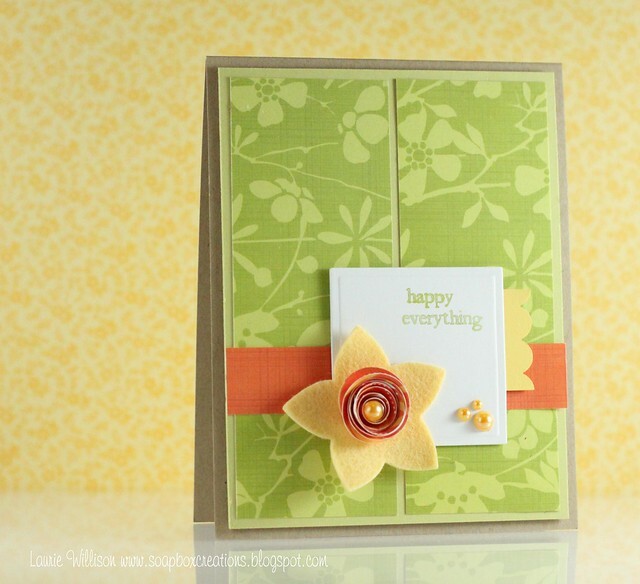 I love the flower that you have created and the die cuts as well. What a great take on Laurie's card! love how you used the die cuts in your design. Great flower.. This is really pretty! Those cut outs are such a fun detail! Thanks for playing at Muse this week! Beautiful card, I love vines leaves and news print flower. I love the detail and dimension you've created with your card. It is absolutely stunning! You've got my vote! What a wonderful card! I love the die cut vines and layers. The flower is stunning and the colour choice is fabulous. Did I forget to mention I love your card?! Beautiful card Patti - the cut background looks absolutely stunning! This is a very cool card! I just love the look of the negative leaf images with the pretty layered flower!